Russian merchants have traditionally been famous for their charitable ways, which took on a whole new dimension during the late 19th and early 20th centuries. Without any exaggeration we can say that Russian culture would never really have happened had it not been for the support given it by all these big-hearted men of business. Was this because Russian moneybags were more generous than their colleagues in the west? The thing is that most of those Russian merchants were very religious people, always trying to follow the Biblical commandment which says: “For I was an hungred, and ye gave Me eat; I was thirsty, and ye gave Me drink; I was a stranger, and ye took Me in; Naked, and ye clothed Me; I was sick, and ye visited Me; I was in prison, and ye came unto Me … Verily I say unto you, inasmuch as ye have done it unto one of the least of these my brethren, ye have done it unto Me.” (Matt., Chapter 25, Verses 35,36,40). Eager to secure for themselves a place in paradise, the merchants did their best helping the needy in their earthly life… From this deep-lying spiritual basis of the Russian people character stem the ethics of the Russian business and such a unique phenomenon as charity and sponsorship of the arts. People called him a Maecenas and with a good reason too. 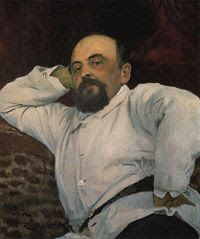 Like Gaius Cilnius Maecenas, the munificent Roman statesman and patron of letters, Savva Mamontov always helped artists and poets and in his country estate in Abramtsevo he organized an artistic club attended by almost every single leading Russian painter, sculptor and architect. The main reason why Savva Mamontov was so much respected by the Russian artistic community, however, was that he himself was a good singer (he studied singing in Italy), composed music, was a sculptor and wrote poems and plays. His artistic efforts culminated in the opening of the Russian Opera Theatre which gave a tremendous boost to the advancement of Russian music. The theatre mostly staged Russian operas, and it was there that many compositions by Mussorgsky, Rimsky-Korsakov, Glinka and other composers had their premiers and later won international recognition. The Private Opera always played to full house which, besides the high quality of its productions, was also explained by the fact that tickets there were much cheaper than anywhere else. This fact was certainly not lost on the music critics, who praised the theater's owner for giving less affluent Muscovites a chance to enjoy, at an affordable price, the very best Russian and world opera productions. Savva Mamontov also deserves praise for his discovery of the great Russian opera singer Fyodor Chaliapin.